' Q: is for Quilting - Sisters, What! As you can see from my posts of yesterday and today I love Sewing. Sewing is a stress relief for me and Quilting is becoming one of my favorite escapes. Which means I don't get to do it enough. 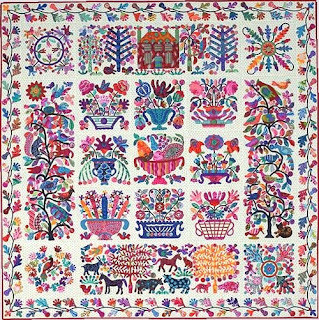 Because I have multiple works in progress and only a couple finished quilts, I wanted to share with you my inspiration for quilting and also share the fabulas talents that I am surrounded by. Growing up our Mom taught all of us girls how to sew. Now 3 of the 4 of us enjoy quilting, we promise to get Sierra there one of these days. She is still resisting. Hava actually just finished her first quilt and I am proud to share it with the world. Using her words of course. 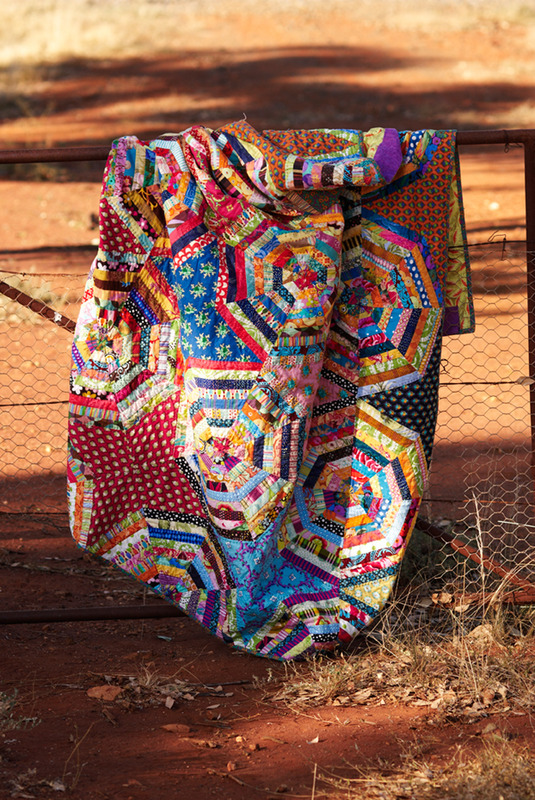 Joy has shared her quilts here and here and promises more to come soon. My Mom has made amazing baby quilts for my boys and I will share them today also. I also want to welcome my Sister in Law Brittany Burton. 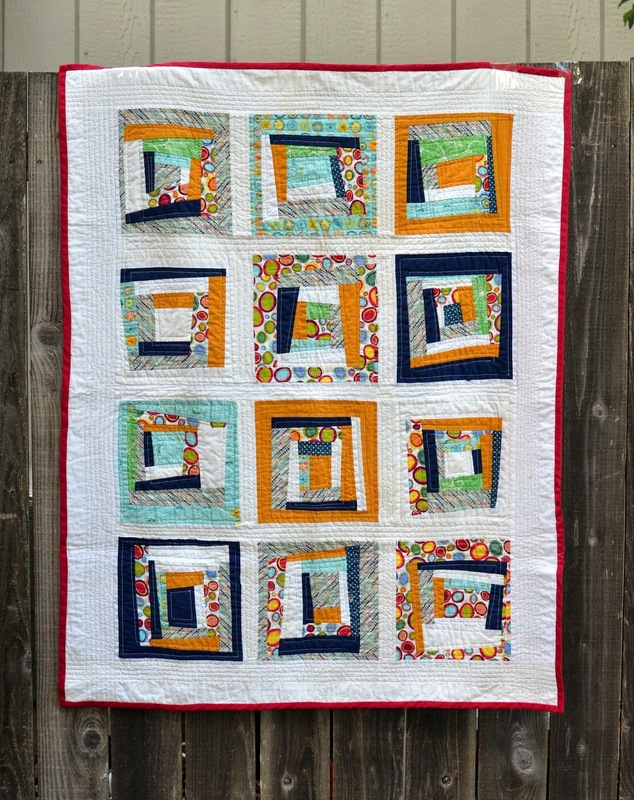 She is an amazing quilter and has inspired me to try many new things. Like Paper Piecing that I shared yesterday. 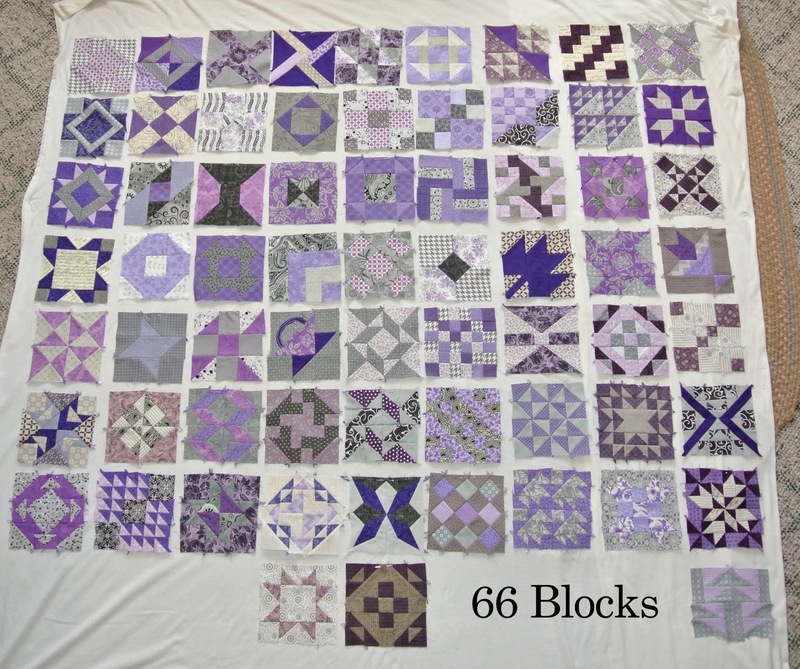 She has agreed to share some of her quilts and gave me some great links to other amazing quilt sites. I call this"the Alice in Wonderland" quilt. I decided to start off doing a lap/baby size quilt to make it doable and easier on myself. I thought doing log cabin crazy squares would be an easy quilt to start with, however, it was much harder than I thought. I learned that squaring the actual squares is important to do perfect, and after piecing everything together I realized that the squares weren't perfect. Oh well, I learned my lesson. Also, I completely came up with this pattern myself, but I after doing it I think it would have been easier and better for me to follow someone else's tutorial or pattern. Again, another lesson learned. Because I didn't think the quilt didn't turn out the best, I decided to save the money and quilt it myself. It was quite the risk, but I used fabric spray to hold all the layers together. Also, I was just going to do straight lines so I figured it couldn't be to hard. I think I got lucky. The quilting was much easier than I thought. Over all I enjoyed making this quilt, but I really want to do a sew along with someone for next time. Thank goodness I'll be living near my sister and mom soon : ). Instead of having a book for guests to sign, we had them sign a quilt my mother made for me. Traditional Log Cabin quilt I made. A modern hounds-tooth design that I made for my mom using Kaffe Fassett fabrics. A quilt I made for my daughter when she was born. Though I do enjoy piecing at the sewing machine, I find tremendous joy in hand work, especially applique. I love the vibrant designs of Kim McLean. 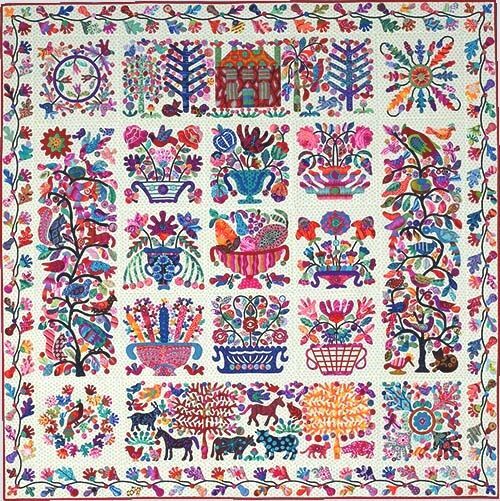 She uses a lot of Kaffe Fassett prints (Kaffe Fassett is one of my favorite fabric designers). 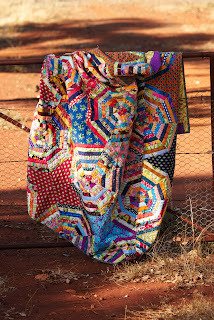 The women 'Down Under' (in Australia) at Material Obsession are always coming up with some of the most amazing quilts. I think much of the work that passes through their little shop is innovative and their blog is always inspiring me. So don't laugh.....I have decided it is better to have works in progress then to put off starting something new. Many of my WIP I have been working on for a couple years. School and being a Mom hasn't left me with much extra time. I will finish my bachelors degree in July so I am hoping that will leave me with some extra time to sew. Sewing does keep me sane though. These quilts I started 3 Christmas past. I bought three quilts at Ikea and I am working on appliquéing stars on them for my boys. These are the first 2 done and I only have 1 more to go. It will be a red quilt with grey and white stars. Over a year ago Brittany asked me if I wanted to join a group all making the Farmer's Wife Sampler. It has been fun having a group of women from all over sharing progress all on the same quilt. It was also amazing to see how different each them are because of the different fabrics we all picked. 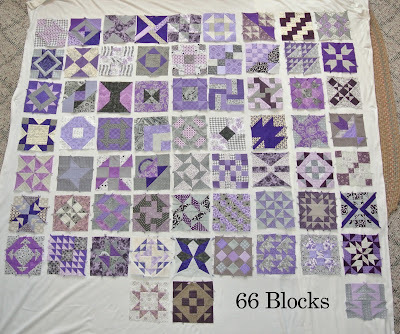 I have 66 blocks done, only 44 more to go. I love the colors purple and grey so that is what I chose for my color scheme. Hopefully soon I can share the finished product. Brittany also introduce me to Applique quilting. I at first resisted because I didn't want to sew by hand. But after learning to do the stars on the above quilts I found I enjoyed it. Last summer I visited Utah for a week and went with Brittany to her applique class I decided I wanted to do more. Her teacher Jeana Kimball offered an online class and I jumped on the chance. I am also behind in that but I am enjoying the moments I have working on it. Here are the blocks I have finished.